We understand the human body is a complex and interrelated system and we therefore seek collaboration to provide a more holistic approach to the Research we provide. The team focuses equally on the needs of the participants as well as those of researchers ensuring that our volunteers have a positive experience and re-engage in research. Collaborative work is at the core of our practise and we support cross working for the best use of our resources. Our experienced nurses have a wide skill mix and are given the opportunity for career progression, therefore some of them study towards Masters or PhD degrees. Nursing research is a major priority alongside the support of the academic studies undertaken, future nursing projects aiming to improve patient experience and enhance care pathways are in development. The success of our team is reflected in various awards received and publications. Our nurses have a tracked record as top recruiters in multi-site national randomised controlled trials and clinical studies. Our team care passionately about doing work that helps others. We came together as a group to share, discuss and agree on the culture we would like to foster, the standards that are important to us and the principles that should underpin our work. The results, which can be found below, were personal and pertinent, embodying the shared beliefs of the ORNIID team. I am qualified as both a nurse and a physiotherapist, and have worked in health research for over seven years following work as specialist colorectal/ pelvic floor nurse. My main area of expertise is gastrointestinal disease, surgery and cancer. For the last four years, I have been building up and leading ORNIID. I currently work on national and international collaborative work, study design, securing approvals from ethics and funders, and supporting other research nurses to fulfil their career progression. Alongside my post as a research manager, I am also working towards a PhD qualification and hope to pursue a nurse-researcher role in the future. Enthusiast in raising the nursing profession profile and supporting early career nurse researchers, I am hoping that our current and future team work will set an example for others to follow. I first became interested in research during University; realising its value in advancing our knowledge of science and medicine, improving treatments for life threatening/life altering diseases and ultimately refining medical practice. 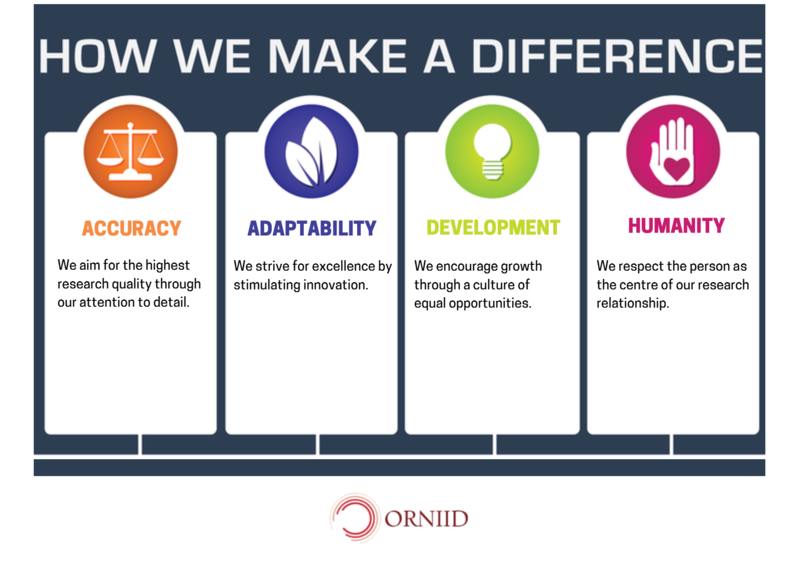 This inspired me to join ORNIID, where I work as a Research practitioner and Lab technician alongside the nurses. Having both a laboratory and clinical role has offered me fantastic insight into multiple aspects of translational gastroenterology. It has also allowed me to not only endeavour into the pathology of chronic diseases like IBD, but also to see how such diseases can affect a person’s quality of life. In future I hope to continue gaining valuable laboratory experience, pursue further education and certainly remain and progress in the field of research where I continue to be inspired by those I work with. I have a long background in scientific publishing and when I decided it was time for a change getting involved in research felt right. It is great to be able to support this wonderful team of nurses and is incredibly fulfilling. There is such a diverse range of projects to work on and I'm able to put to use my previously gained skills in ways I didn't even consider when working in publishing. As well as supporting the team in their day to day job I'm also currently working on a new database to track our participants and their samples. I'm heavily involved in trial governance and coordination. I have been an endoscopy nurse for 8 years and over the course of that time have met many patients with IBD such as Ulcerative colitis and Crohn's disease which has given me an interest in research as I have observed and handled the care of these patients on their good and bad days. Now that I am a part of this team I have a deeper understanding of the disease process, treatments and patients experience. Being able to attend conferences has broadened my understanding and made me appreciate the importance and the advancement of research. What interested me in research? I realised the exciting world of research that lay behind the frustration of data cleaning and assumptions of statistical analysis when the findings of a Post Doctoral researcher were at an evening talk at the university. His PhD had found babies younger than 6 months old had a higher incidence of malnutrition and household injury if their mothers’ were suffering from postnatal depression in a population of women in rural Pakistan. His follow on study explored how a simple intervention with Community Health Workers, based on the principles of Cognitive Behavioural Therapy, could reverse this trend. Research, when done well can be accessible and have far reaching implications. Asking the question can uncover answers that lead to changes in practice, direct care, policy, and ultimately improve lives. Professor Rahman’s work made me want to be part of that world. He also made me realise that research is a journey with lots of experts to guide you, but your perspective makes the questions you ask equally valid. I am a registered adult nurse and have worked in healthcare both clinically and commercially for over 15 years. I have a keen interest in “benchtop to bedside research”. Research within healthcare helps to improve quality, safety and efficiency of patient care. I have recently completed an MSc in Nursing, my research interests include, digital health, video informed consent, shared decision making and patient experience in perioperative care. While working as an endoscopy nurse a few years back I met one of the research nurses who was conducting a study in Endoscopy at the time. My curiosity made me ask questions about research and different projects in clinical trials and apply for a job in Gastroenterology and Hepatology Clinical Trials. I worked in clinical trials mainly with IBD patients and I realised the complexity of these diseases and how little I knew about it. I then started working as an IBD nurse specialist where I learnt a lot about IBD and the people living with these chronic diseases. In 2017 an opportunity arose to work for Oxford University and now I am back in the interesting and fascinating world of research working on non-interventional cohort studies. Currently I am completing a "Research Methods" module at Birmingham University in order to gain more knowledge and further develop my research skills. "When a person decides to become a nurse, they make the most important decision of their lives. They choose to dedicate themselves to the care of others". And this is exactly what happened to me. To begin I was considering between being a lawyer or a doctor but somehow things have changed and I became a Nurse instead. I knew I'd be a good nurse, but I wanted to be more than that. I wanted to be a nurse who could make a change in a community; one who could improve the lives of a patients through quality, compassion and culturally centred patient care. My name is Janette and I have been a nurse for 26 years having worked in almost all specialised areas of care. My background lies in Adult Nursing, specialising in Respiratory, Medical and Surgical. What made me decided to work as a Research Nurse is the uniqueness of its approach to different people, its key role as a patient advocate whilst ensuring patient safety and protection and making sure that patients are well supported throughout the research study. During my experience in Endoscopy I have met a lot of people in the field of Research Nursing and they seemed to really love their job and it made me wonder if I would like to do a similar role and it intrigued me to know more about it; and now I'm part of their team. I've now realised that being a Research Nurse is not just about collecting samples, it requires knowledge and understanding of everything that you do. It needs a wide range of skills including management and organisational skills, teaching, mentoring, communication and IT. And being independent in making decisions and is vital. And I like that.